Draup conducted a study with top TEM organizations to understand their engineering priorities. A couple of years ago Nokia, Ericsson, and several other global telecom equipment manufacturers, announced their intent to take on large 5G projects. Within this time, these giants have managed to implement large R&D teams and centers to accelerate and commercialize their 5G efforts. A good indicator of this intent is by analyzing their current talent pool which stands at nearly 12,000 core 5G engineers and about 28,000 trainable engineers who are 5G-ready. A deeper analysis of the job-corpus has unearthed 30+ job roles clustered across 7 job families. There are largely 4 focus areas such as Core 5G-baseband engineering, 5G software development, Physical/ASIC 5G engineering, and implementation and orchestration of 5G platforms. We have also discovered the presence of emerging roles such as IoT engineer, ML engineer and security engineer. TEMs and network providers are undertaking efforts to upskill their existing workforce to enable 5G capabilities. Firms like Qualcomm, Intel and Cisco have implemented internal training programs while several online learning platforms such as Udemy and Coursera are offering 5G engineering courses and courses geared towards 5G research and standardization. 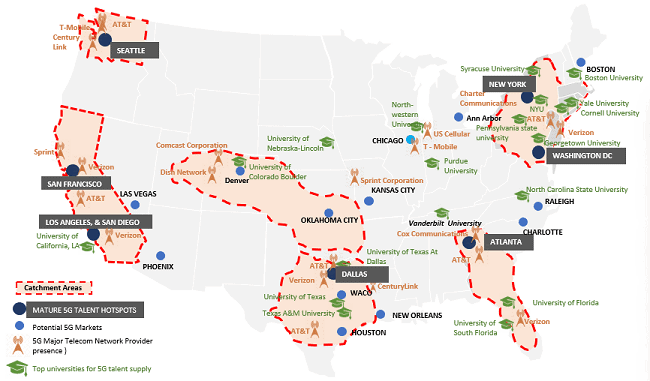 TEMs and network providers have also collaborated with universities such as the University of Texas – Austin, and New York University to undertake large research programs to accelerate 5G. 5G implementation will require high-level network architecture and global TEMs have announced several projects and partnerships in their efforts to achieve full-scale implementation. Most of these projects have been announced by TEM giants such as Nokia, Ericsson, Huawei in various locations across the US and Europe. They have also announced 5G partnerships with telecom network operators such as AT&T and Verizon. China is expected to become the largest 5G market in the world with some estimates suggesting over 400 million connections by the end of 2025. Huawei has taken the leading step to fuel China’s dominance in the 5G space by making significant contributions toward developing 5G standards and being among the first to carry out 5G trials. While full-fledged commercial implementation of 5G is still some time away, the race to become pioneers in this technology is most definitely on! A lot of startup-related metrics such as, Supergiant rounds, Unicorn investments, Total Funding etc., are on track to hit multi-year or record highs in 2018. A record number of venture-backed companies (23) valued at over $1 billion have launched IPOs so far in 2018, outpacing full-year totals for 2016 and 2017. These newly public unicorns are doing pretty well too, their shares are either meeting or above expectations and 6 of these are valued at over $10 Billion. Unicorn M&A market is seeing tremendous activity as well. Big transactions like Walmart’s $16 billion acquisition of Flipkart and Microsoft’s $7.5 billion purchase of GitHub have helped boost the totals. 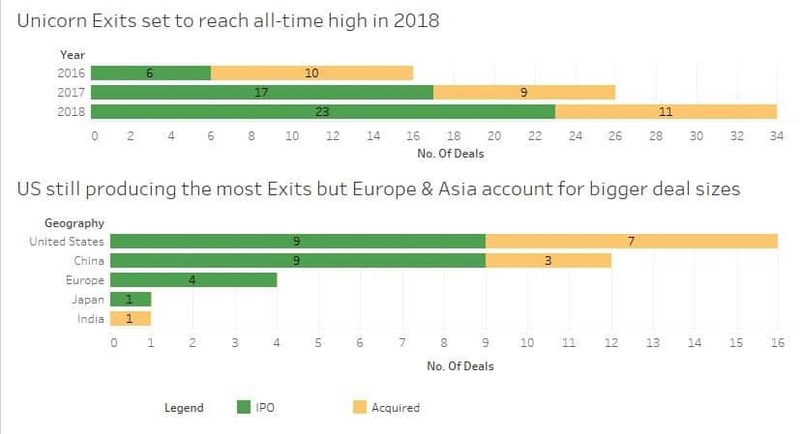 The United States produced the most Unicorn exits this year but the total dollar value of these exits was higher in Asia and Europe. 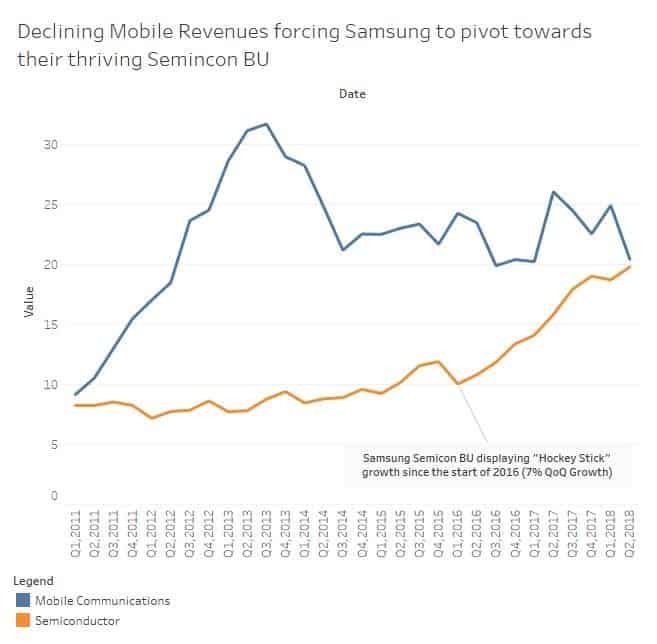 Samsung Mobile has lost its leadership position in the 3 biggest markets while the Semicon BU has displayed hockey stick growth in revenues. Samsung generated more profit in 2017 than in 2016 + 2015 full years combined. This is a phenomenal growth story for Samsung Electronics as the bulk of the growth in the top and bottom lines is not driven by the mobile division but the semiconductor division. The was mainly caused by the shift to higher storage capacities (that started with Apple’s iPhone and was also adopted by Chinese brands) have kept the demand for Samsung memory parts at an all-time-high. Simultaneously, Samsung has lost its leadership position in the Indian, Chinese and American smartphone markets leading to declining revenues from the Mobile Communications BU.